Over ten years ago when I was finishing college, I started a short-lived financial news parody website called Donkeybusiness, now gone from the web. The first article I put up on the site back then has become relevant to global monetary policy today, especially in light of the fourth paragraph, and I thought I'd share it with you. Attempting to propel the country out of a decade-long economic decline, Japan’s government announced that the national currency would be changed from Yen to Beef. The target date for the switch is New Year’s Day, 2002. Efforts to ready the economy for the new currency are under way. Vending machines and arcade games are being refitted with new slots and freezer compartments so that they can be changed from coin-operated to Beef-operated. 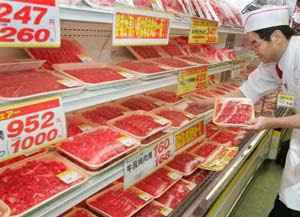 Electronic security measures are being devised to prevent counterfeiters from using beef substitutes. I like to tell people about this article when I'm explaining the phenomenon of a liquidity trap and why I support for inflationary monetary policy at the present. If you replace your currency with a meat, people have to spend it before it goes bad. So it gets more spending going. Inflation basically makes your currency perishable, like a meat, so it has the same stimulative effect. Just want to say that that piece is absolutely brilliant! It's funny, and it insightfully illustrates the underlying point about the usefulness of inflation.